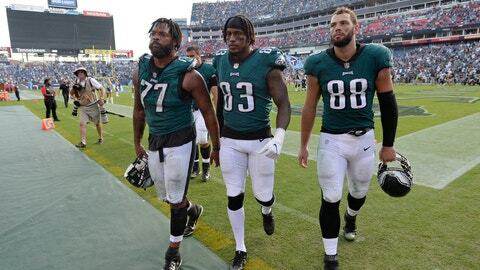 At the quarter point of the season, the Philadelphia Eagles (2-2) have an inconsistent offense and a defense that can’t stop anyone on the road. But coach Doug Pederson isn’t ready to make major changes following a 26-23 overtime loss at Tennessee. “We have to be more efficient in all three areas, obviously, offense and defense,” Pederson said Monday. “But our efficiency as we look at it as a staff and as coaches, we have to be careful that we are not just on a whim swapping people out. If you start doing that, it starts moving other people around as well. The secondary was torched by Marcus Mariota, who was 30 of 43 for 344 yards and two touchdowns. Ryan Fitzpatrick had 402 yards passing and four TDs against the Eagles in Tampa’s 27-21 victory in Week 2. Cornerbacks Jalen Mills and Ronald Darby are having trouble in one-on-one coverage, but lack of pressure by the defensive linemen isn’t helping the coverage guys. Mills gave up several big plays, but it doesn’t appear the team is ready to demote the third-year pro. At home, the defense has been dominant against Matt Ryan and the Falcons and Andrew Luck and the Colts. On the road, it’s been a struggle.